WASHINGTON (CN) – One week into the government shutdown driven by his demand for border-wall funding, President Donald Trump doubled down Friday by threatening to close the U.S.-Mexico border. A complete closure of the entire 1,954-mile stretch separating the United States and Mexico has never been tried before, but historical data shows even partial shutdowns of the border can wreak havoc on the U.S. economy. The U.S. government sealed several land ports along the border after the Sept. 11 terrorist attacks, but the restrictions were in place for only a short time and were targeted at certain crossing areas. At the time, custom officials were asked to stop every crossing vehicle and conduct an exhaustive search before granting entry. The searches caused serious delays and in some cases resulted in product shortages for automakers like GM and Ford, which were forced to delay manufacturing as parts sat on trucks just beyond their reach. To close the border altogether would interrupt a staggering $558 billion in products flowing between both the U.S. and Mexico, according to the U.S. Bureau of Transportation Statistics. The bureau also reported that, from the U.S. to Mexico alone last year, the U.S. exported a total of $243 billion in goods and $58 billion in trade. 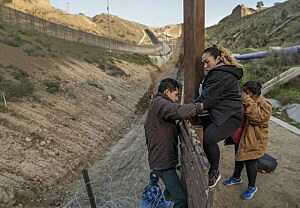 In an interview this morning, Michelle Mittelstadt, a spokeswoman for the Migration Policy Institute in Washington, D.C., said that Trump’s border-shutting threat ignores basic realities around the routine flow of activity between Mexico and the United States. “Just consider the level of legal traffic that goes back and forth between the U.S and Mexico on a daily basis: you have people in the U.S. who work in Mexico, you have hundreds of thousands of Mexicans who have border crossing cards who come into the U.S. daily for shopping, work and tourism,” she said. “This would be nothing short of a vast disruption,” Mittelstadt said. Even in deep-red Texas, reactions to Trump’s tweet were negative. Pat Jimenez, a 53-year-old of Cherokee and Mexican descent, said a border closure would be a mistake because it would stop immigrants who want nothing more than to make honest livings in the U.S.
“He would be stopping people from coming to a better place and getting jobs,” said Jimenez, a lifelong Houstonian. She said in some areas of the northeastern Mexican states Tamaulipas and Nuevo Leon, residents have to travel long distances to get to a store and some choose to cross the border into Texas for their grocery shopping. “He would be blocking their access to better stores,” she said, sitting on a bench in a Houston shopping center Friday morning. In 2005, the San Diego Association of Governments and the California Department of Transportation issued its own findings on the economic impact of border closures at the San Ysidro-Puerta Mexico and Otay Mesa-Mesa de Otay ports of entry. Another $1 billion flowed at the Tecate entry, the Department of Transportation reported. Excessive border wait times merely preview what the impact from a full closure might look like. After 3,600 surveys of border crossers at San Ysdiro in 2005, the California Department of Transportation concluded that the average wait time to cross – just 45 minutes – cost the U.S. economy nearly $1.3 billion in lost potential revenues. In 2011, the University of Southern California’s CREATE Homeland Security Center painted an even broader picture in its report featuring economic projections of what a total border shutdown would look like. According to the report, if the U.S. shut down all of its borders for a year, including the border with Canada, imports would be slashed by 95 percent and the GDP would plummet by 48 percent. The simulation includes some exceptions: If oil imports were allowed to flow over the border and laborers “accepted real wage cuts,” then GDP impact would be closer to 11 percent. Following Trump’s refusal last week to sign off on a budget that did not include $5 billion for his border wall, the Departments of Homeland Security and Justice have been have been hampered by the the partial government shutdown since Dec. 22. The shutdown has also kept small business owners from receiving technical assistance for federal loans, and homebuyers seeking federal money will also find services chilled. Other services like routine food safety inspection by the U.S. Food and Drug Administration, will also be delayed during the shutdown. Roughly 420,000 federal employees are expected to continue working without pay as well. This weekend, the president was expected to travel to Palm Beach, Florida, for the annual New Year’s bash at his Mar-A-Lago resort. Acting White House Chief of Staff Mick Mulvaney told hosts of “Fox & Friends” Friday morning, however, that Trump is staying in the White House now to work on reopening the government. Mulvaney placed blame for the shutdown squarely on the shoulders of Democrats. “Not a single Democrat” would consider a revised deal to lower the initial $5 billion request for border wall funding, he said. White House Press Secretary Sarah Sanders also told CBS on Friday the president and lawmakers are “far apart” on an agreement. Lawmakers are expected to return to Capitol Hill Monday to resume negotiations. Cameron Langford contributed to this report.